You could save money every time it rains. Unnecessary water usage is one of the biggest issues facing sustainability. Every day, the average American uses 2,000 gallons of water. To put that into perspective, the average African family uses just 5 gallons a day. Of course, some aspects of water usage are unavoidable, but many others can easily be reduced in order to cut down on the overall amount of water you use. One alternative method of saving water is with rainwater harvesting. Harvesting rainwater can save water by mitigating the need for hosepipes, and it can also bring a wide range of benefits to your garden. The idea of capturing and storing rainwater goes back thousands of years to when we first started to farm the land and were in need of new ways to irrigate crops. During the rainwater harvesting process, rainwater is collected from the roof of a property using guttering and downpipes. It is then guided down to a water tank for storage, where it is filtered upon entry to remove any debris. When you are ready to use the stored water, a submersible pump will deliver the water on-demand to where it is needed. This makes rainwater harvesting systems the perfect environmentally friendly way to water your garden. In fact, rainwater harvesting tanks are experiencing a renaissance due to the rise of green living. And this practice doesn’t just benefit the planet — it also benefits your garden. Summer droughts are a regular occurrence during the warmer months, causing water restrictions to become increasingly common over recent years. Therefore, it makes sense to collect excess rainwater, which would otherwise just end up being wasted, for use at a later date. Some people use traditional garden water barrels, but many of these simply don’t have the capacity to store a lot of water. After a few dry days, the supply provided by a traditional water barrel will be used up, leaving your garden at the mercy of the weather. Conversely, rainwater harvesting systems will usually use a much bigger water tank than barrels, ensuring you will be able to store enough water to see your garden through the dry spell. In many instances, switching to rainwater can also end up saving you money. Although you do incur the initial installation costs with a water tank, you will save money and drastically reduce your water bill over time by limiting the need to water your garden with a hose system. The specific amount of money you save will, of course, depend on your individual circumstances, but factors to take into consideration include your water consumption habits in your garden, meteorological factors, and the size and cost of the rainwater harvesting system that you choose to install. Statistically, California receives the least amount of rainwater, meaning that families in the the Golden State could stand to benefit the most from rainwater harvesting tanks. The specific size of your tank will depend on your watering needs. For example, an inch of rainwater covering a 200 square-foot garden equates to 125 gallons of water. If you were to invest in a standard 300 gallon tank, you could store more than two days worth of water to maintain your garden. Rainwater harvesting systems and water tanks are also relatively easy to maintain, only requiring semi-frequent checks and filter changes. This cuts down on time and effort, giving you extra time to spend on other aspects of your garden. Plus, as it won’t be used for drinking water, you won’t need to spend additional money on expensive purifying systems for your tank. 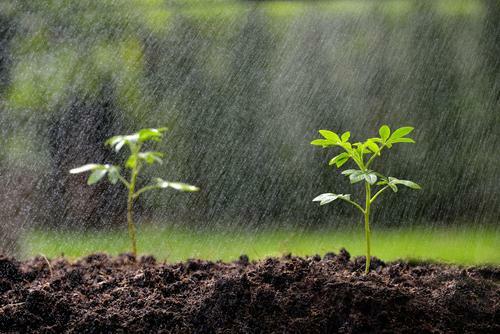 Most plants grow better in rainwater because it has a naturally balanced pH level. Rainwater is also free from harsh and potentially dangerous chemicals such as chlorine, a necessary disinfectant found in tap water. Too much chlorine is bad for plants and can cause problems like spotted or discoloured leaves. Tap water also contains more sodium than rainwater, which can damage the soil structure and create cracks on the soil’s surface. 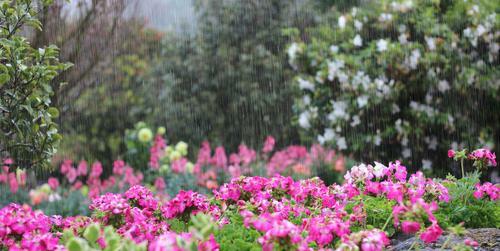 You may have noticed that your plants look greener after it has rained. This is because the air is 78% nitrogen – the element that makes plants green. Some nitrogen, in nitrate and ammonium forms, comes down in the rain and is taken in by plants. By using rainwater that has been stored, as opposed to distilled water, you can replicate the effects of rainfall to better feed your plants the nutrients they require. Filtered rainwater is also less likely to carry diseases, reducing risks to plants and wildlife. In all, rainwater harvesting is the perfect way to maximize the benefits that natural rainwater has to offer, making your garden a much healthier environment. 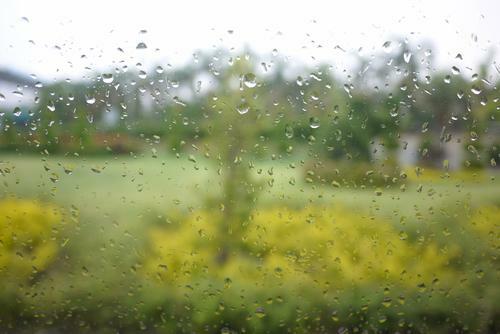 Since levels of rainfall are largely unpredictable, it is always beneficial to have a ready supply of good-quality, natural rainwater available to give your garden a helping hand when the sun is shining and there isn’t a single cloud in sight. A well-stocked water tank will make sure that your garden never has to feel the negative effects of a drought again — plus, you won’t have to worry about the added expense of using a hose daily. There are many benefits of installing a sustainable rainwater harvesting system and using a water tank to keep your garden fresh and vibrant. Maintaining a lush, healthy garden all year round has never been easier. Lorna Walker is a freelance professional and gardening expert. 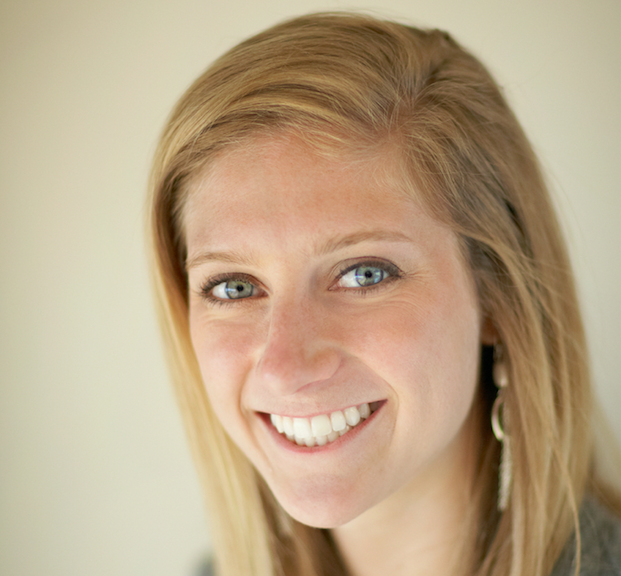 She is committed to leading a sustainable life and hopes to inspire others through her love of gardening and nature. "Rainwater harvesting systems are the perfect environmentally friendly way to water your garden."